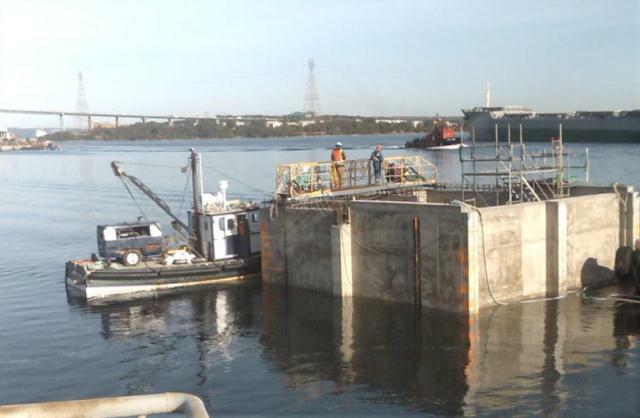 As part of an overall circulating water improvement at the Nova Scotia Power Tufts Cove site in Halifax Harbour, NS Dexter Construction engaged Harbourside Engineering Consultants to conduct a floating analysis of the large concrete intake structure that was fabricated on the Halifax side of the Harbour, but needed to be floated into position at the Tufts Cove site (the Dartmouth side of Halifax Harbour). Due to the geometery of the intake structure, HEC determined that it would not remain level during the floating operation, and there would be insufficient draft at high water to install the structure on the pre-installed rock mattress at the site. HEC used large float bags to level the structure during the floating operation, thereby creating 250 mm (approximately 10”) of clearance between the underside of the floating structure and the rock mattress at high tide. This was just enough to allow the structure to be floated into position unimpeded. The use of float bags also limited the amount of temporary works or ballasting required to level the structure to ensure sufficient draft. HEC also designed temporary bulkheads to seal holes in the lower part of the structure in order to allow for the floating transport.